Wireless Large Print Multimedia Yellow keyboard. 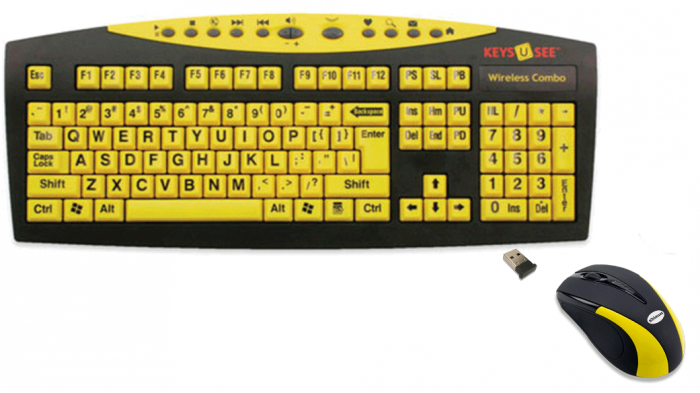 Keys-U-See Wireless is a wireless keyboard that has large print keys that are easy to see, even in low light, and includes internet, multimedia and energy-saver hot keys. Includes wireless mouse. Keys-U-See Wireless with Mouse. Highly visible large print letters on keycaps, over 400% larger. One-touch Internet and email hot keys - This user-friendly large print keyboard also has 12 "hot keys" providing easy access to common functions. 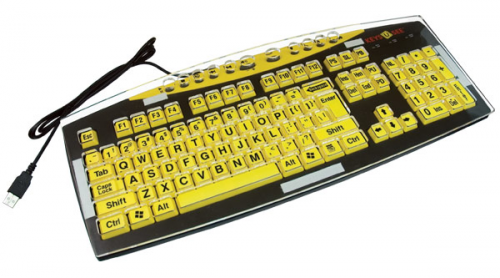 It is a full size enhanced 104 key keyboard with standard US English keyboard layout printed in big and bold 41 point typeface on the keycaps and features high contrast yellow keys with black printing.